Tanning Equipment & Tanning Beds. There is no such thing as a safe or healthy tan. Exposure to ultraviolet A (UVA) and UVB radiation from tanning equipment can cause sunburn and eye damage, as well as increase the risk of skin cancer and other UV-related negative health effects. Early exposure to tanning beds can increase a person’s chance of developing melanoma by up to 75%. Among those who first used a sunbed before age 35, the risk of melanoma is increased by 59%. Did you know Tanning Beds cause more cancer than cigarettes? In 2009, WHO’s International Agency for Research on Cancer (IARC) classified exposure to UV-emitting tanning devices as carcinogenic to humans. More than 40 national and provincial authorities around the world have now implemented outright bans or restrictions on the use of sunbeds. However, much more work is still needed to restrict their use. 1 Zhang M, Qureshi AA, Geller AC, Frazier L, Hunter DJ, Han J. 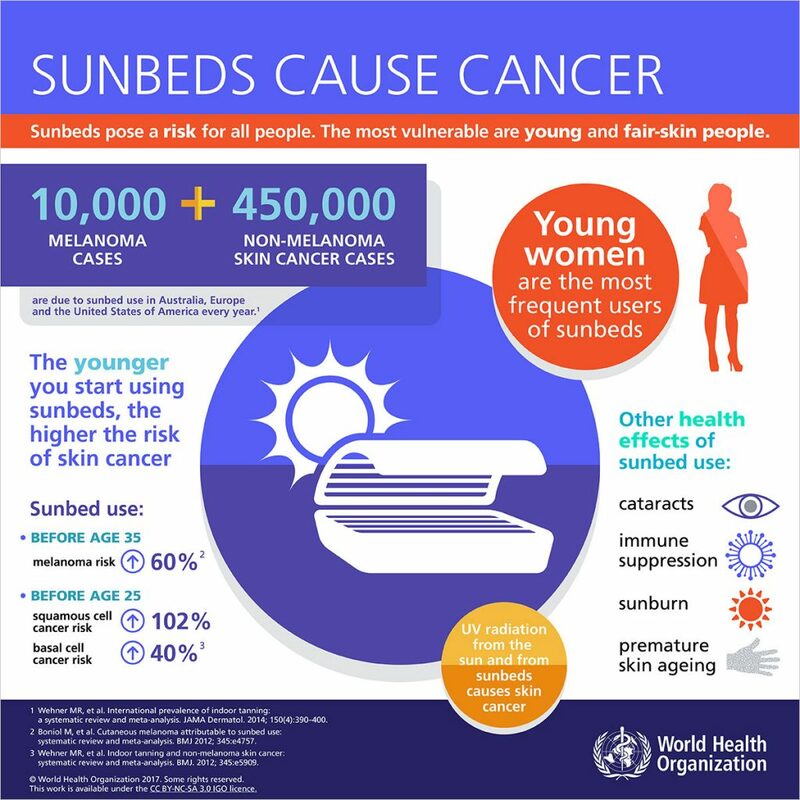 Use of tanning beds and incidence of skin cancer. J Clin Oncol 2012;30(14):1588-93. 2 Boniol M, Autier P, Boyle P, Gandini S. Cutaneous melanoma attributable to sunbed use: systematic review and meta-analysis. BMJ 12;345:e4757. The International Agency for Research on Cancer Working Group on artificial ultraviolet (UV) light and skin cancer. The association of use of sunbeds with cutaneous malignant melanoma and other skin cancers: systematic review. Int J Cancer. 2007 Mar 1;120(5):1116–22. Hirst N, Gordon L, Gies P, Green AC. Estimation of avoidable skin cancers and cost-savings to government associated with regulation of the solarium industry in Australia. Health Policy. 2009 Mar;89(3):303–11. Lazovich D, Vogel RI, Berwick M, Weinstock MA, Anderson KE, Warshaw EM. Indoor tanning and risk of melanoma: a case-control study in a highly exposed population. Cancer Epidemiol Biomarkers Prev. 2010 Jun;19(6):1557–68. Cust AE, Armstrong BK, Goumas C, Jenkins MA, Schmid H, Hopper JL, et al. Sunbed use during adolescence and early adulthood is associated with increased risk of early-onset melanoma. Int J Cancer. 2011 May 15;128(10):2425–35. 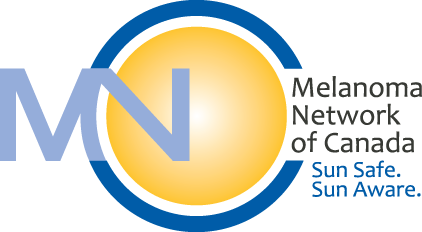 Veierød MB, Adami H-O, Lund E, Armstrong BK, Weiderpass E. Sun and solarium exposure and melanoma risk: effects of age, pigmentary characteristics, and nevi. Cancer Epidemiol Biomarkers Prev. 2010 Jan;19(1):111–20. Vajdic CM, Kricker A, Giblin M, McKenzie J, Aitken JF, Giles GG, et al. Artificial ultraviolet radiation and ocular melanoma in Australia. Int J Cancer. 2004 Dec 10;112(5):896–900. Schmidt-Pokrzywniak A, Jöckel K-H, Bornfeld N, Sauerwein W, Stang A. Positive interaction between light iris color and ultraviolet radiation in relation to the risk of uveal melanoma: a case-control study. Ophthalmology. 2009 Feb;116(2):340–8.